Bœuf de Chapi Take a small round of Heifer beef, with the Holder, cut out the bone, let it [lye?] two or three days in a little salt, and a sufficient quantity of salt [illegible] to make it red. 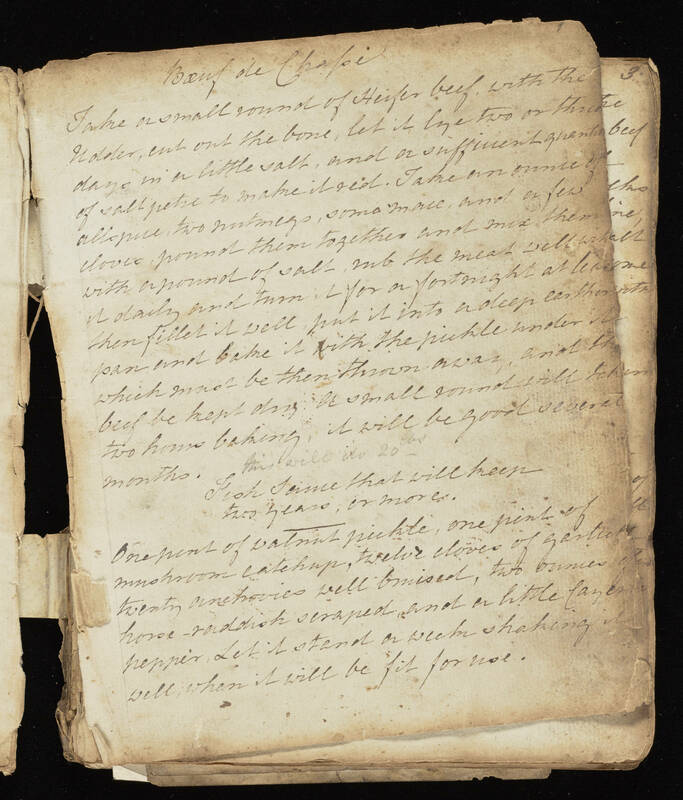 Take an ounce of allspice, two nutmegs, some mace, and a few cloves, ground them together and mix them, with a pinch of salt, rub the meat well with it daily and turn it for a fortnight at least then filter it well, put it into a deep earthen pan and bake it with the pickle [another?] [illegible] which [may?] be then thrown away, and the beef be kept dry. A small round will take two hour baking, it will be good several months. [Hioh?] [Same?] that will keep two years, or more. One pint of walnut pickle, one pint of mushroom ketchup, twelve cloves of garlic, twenty one [hovies?] well braised, two ounces of horse-radish scraped and a little Cayenne pepper. Let it stand a week shaking it well, when it will be fit for use.